Editors: Johnson, Devon, Farrell, Amy and Warren, Patricia Y. This important volume demonstrates how highly publicized criminal cases go on to shape public views about offenders, the criminal process, and justice more generally, perpetuating the same unjust cycle for future generations. 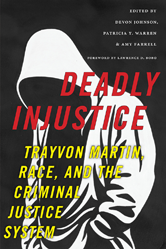 A timely, well-argued collection, Deadly Injustice is an illuminating, headline-driven text perfect for students and scholars of criminology and an important contribution to the discussion of race and crime in America. PART I. WHO IS IN DANGER? PART II. WHERE DO YOU STAND? PART III. WHICH VOICES COUNT?